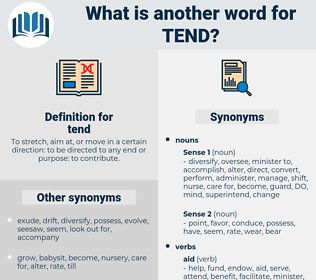 What is another word for tend? To stretch, aim at, or move in a certain direction: to be directed to any end or purpose: to contribute. art in the service of. Undertaken, are, AM, laid, prefer, incline, extend, strive. 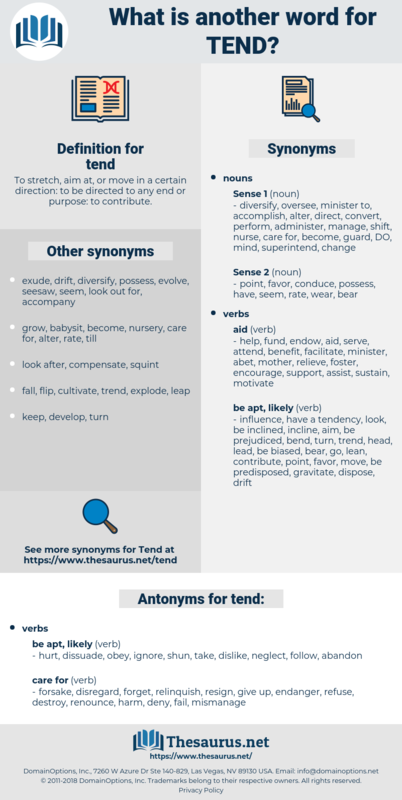 lay, prefer, frequently, extend, strive. hurt, dissuade, obey, ignore, shun, take, dislike, neglect, follow, abandon. forsake, disregard, forget, relinquish, resign, give up, endanger, refuse, destroy, renounce, harm, deny, fail, mismanage. They always tend to blame us, Ms. . The climax of Mr Jack's visit did not tend to restore him. take care, see, attend, mind, look.